Advocate USA Publishing is pleased to make Dr. Manley's books available in collector's condition with AUTOGRAPH and INSCRIBED to you personally! You may select either book for just $19.99 or save more by buying BOTH books for just $24.99! Autographed, inscribed and a special gift! Sorry, United States Buyers Only. If you are an International Buyer, please order through Amazon at this link at special price. Simply select the book (or books) you would like, fill out who to inscribe the books to and use the secure PayPal button below! 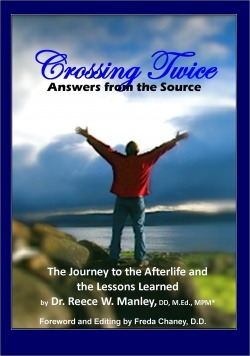 Crossing Twice recounts the inspirational story of Dr. Manley’s near death experience, journey through the veil and ultimate joining of the love and light that awaits us all on the other side. The book is written from a progressive Christian prospective, but is respectful of all spirituality and faiths. The book also takes the reader through Dr. Manley’s life challenges – abuse, beatings, and neurological disease. But, rather than sit in misery, this book sings with hope, love, inclusion and power! Preview on Amazon and return here to buy above for autographed copies! Advocate USA Publishing brings you a powerful new way of looking at your daily thinking. In it you will be learning to call upon ten specific spiritual principles which bring life changing freshness to the power of your mind. 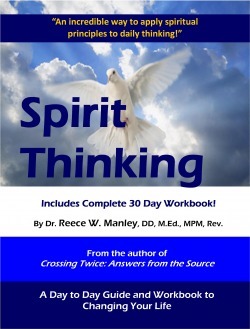 Endorse by psychiatrists, psychologists, social workers and natural healers, Spirit Thinking has been called the most powerful new way to approach living life in the last twenty years! Preview on Amazon and return here to purchase them above autographed to you! Your Free Gift with any purchase is a powerful eBook titled "What Happens When We Die". Click here, after your purchase to have immediate access!